Our Heavy Metalz Studio original hand-carved stamp pressed this vintage-style typewriter lowercase letter. 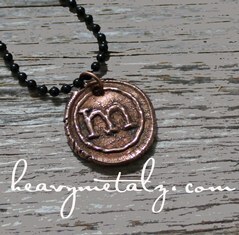 The pendant measures approximately 3/4" and is made from recycled copper. Size may vary slightly from pendant to pendant. Each pendant is hand stamped by me into copper precious metal clay, then fired in the kiln until it becomes a pendant that resembles the old fashioned wax seals found on vintage envelopes. Included with your purchase is a black coated brass ball chain in 16", 18" or 20" length. All letters of the alphabet are available in this font.